The Cleveland Park Club offers a fun, safe and friendly learning environment for children and adults to become stronger, more confident swimmers. Our experienced team allows students to learn at their own pace and master the skills at each developmental stage before undertaking the next challenge. Children's group classes focus on developing basic water skills and stroke proficiency, while encouraging personal development. Students may progress through three different levels: Jellyfish, Stingray, and Dolphin. We also offer private and semi-private lessons for Club members who prefer to work one-on-one with our trained swim instructors. Children participating in swim instruction must be potty trained. Join the Cleveland Park Club as a Social + Activity Member and pay the member rate for swim instruction. For membership information, click here. Register for camp and get a discount on group swim lessons! *Cost covers two students. Both must register at same time and swim at the same level. Please read the class descriptions below and register your child for the class that best fits their swimming ability. If you are unsure, email aquatics@clevelandparkclub.org. Suggested ages are just that, suggestions! What matters more is your child's swimming ability. The goal for each class is to prepare your child for the next class level. Our aquatics team will provide personal feedback to let you know which class is best for your child, how they are progressing, and when they are ready to move up to the next level. This is a beginner level class for children with little to no swimming experience. The class introduces basic water skills and pool safety, and builds a strong foundation for learning buoyancy and movement in the water. Students are encouraged to put their heads under water, float on their front and back, and enter/exit the pool independently. Students will also practice kicking and paddling with their arms. Requirements: No skill requirements. Must be potty trained. This class is for children who are comfortable in the water, but need more practice to become independent swimmers. Students will practice kicking and gliding in streamline position, learn to coordinate their arms and legs in forward movement, and begin the transition from shallow water to deep water skills. Requirements: Must be able to completely submerge head under water and hold breath for at least 5 seconds. Must be able to float on front and back without assistance or use of a flotation device. Should be able to perform a front glide and flutter kick with good technique. This class is for growing swimmers who need to learn and develop technique. Children will focus on proper body positioning, stroke development, and gaining control of buoyancy and directional movement. 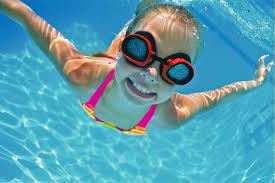 Children will also be introduced to front crawl with rotary breathing, elementary backstroke, and breaststroke. Requirements: Must be able to float on front and back without assistance, tread water for at least 30 seconds, and coordinate arms and legs in forward movement. Should be comfortable in the deep end of the pool. Should know how to perform whip kick (also known as breaststroke or frog kick). Register for Swim Group and Private swim lessons here. If you are interested in Semi-Private lessons, please contact us at manager@clevelandparkclub.org. Credits may be used toward future classes. All credits must be used before the end of September of the year in which they were incurred. Refunds will only be issued if credits were unable to be used.